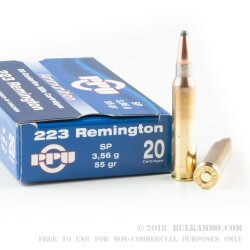 So, you’re in the market for some heat to put in your .223 rifle, are you? Possibly an AR-pattern, Modern Sporting Rifle-type of apparatus? Well this is your lucky day, kid. Prvi Partizan has been in the ammunition business for nearly a century, operating in Serbia, and has a reputation for affordable and reliable products in a wide variety of calibers and types. 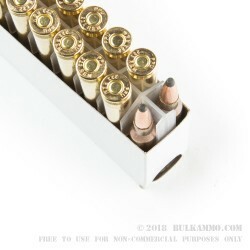 The 55gr projectile is one of the two most common weights of .223/5.56x45mm bullets and is well suited for carbines utilizing 1:8 or 1:9 rates of twist, common to many AR-15 upper receivers. 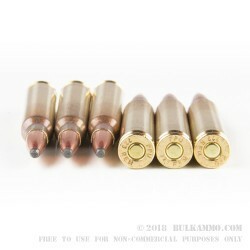 Operating extremely fast, usually in the ballpark of 3,200fps, the 55gr projectile has more than adequate energy, despite its diminutive weight, to expand radically. Soft point bullets are a great all-purpose rounds because they tend to penetrate well yet expand uniformly and retain most of their mass. They work very well on a variety of soft targets, particularly well-suited to anti-personnel and anti-predator tasks (often the same thing, aren’t they?). You can bet your own hide that Prvi Partizan ammo will feed reliably, burn clean, and put down what is in your crosshairs, and the 55gr .223 SP is no exception. Because of their origin you can often fill your magazine for considerably less than their stateside competitors. There is no good reason to sit on these so grab a few boxes today!